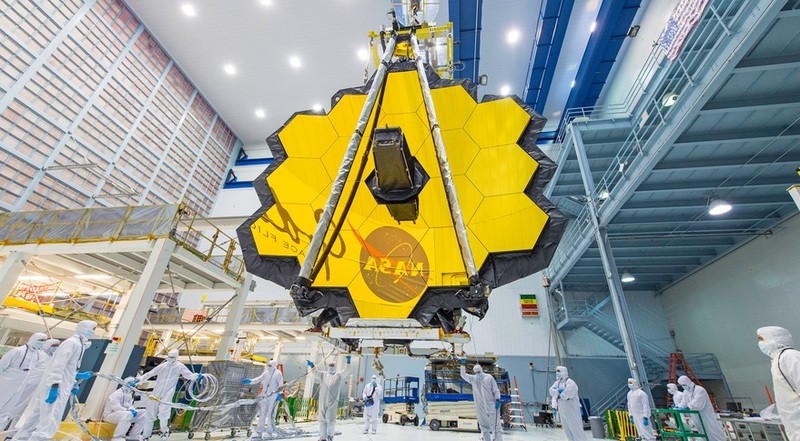 WASHINGTON — A latch that didn’t close properly was the cause of the anomaly that halted vibration testing of NASA’s James Webb Space Telescope last December. In a presentation to the Astrophysics Advisory Committee April 24, Eric Smith, the program manager for JWST at NASA Headquarters, said the mission remained on schedule for an October 2018 launch despite the vibration test problem, but cautioned that the spacecraft’s development is now entering a “complex” phase. An example of that, he said, was the vibration test anomaly. The incident took place Dec. 3 while the telescope’s mirror assembly and instruments, known as the Optical Telescope element and Integrated Science (OTIS), underwent vibration tests at the Goddard Space Flight Center intended to simulate launch conditions. Engineers noticed what the agency called “anomalous readings” from accelerometers on the assembly and halted the test. Smith said engineers heard a noise when that took place. Inspections of the OTIS assembly found no damage, and full-scale vibration testing resumed by mid-January. NASA has since completed those tests as well as a separate set of acoustics tests at Goddard, also designed to simulate the launch environment. At the committee meeting, Smith said the problem was tracked down to a latch designed to hold in place one of the wings of JWST’s primary mirror, which consists of 18 hexagonal segments. Those wings are folded into place to fit within the payload fairing of the Ariane 5 that will launch JWST, then deployed into place once in space. Engineers were able to replicate the noise by placing the plates slightly out of alignment in the lab and subjecting them to similar vibrations, giving them confidence that was the cause of the anomaly. A later test of OTIS under the same conditions did not generate anomalous readings. With the vibration and acoustic tests now complete, Smith said workers are now preparing the telescope for shipment to the Johnson Space Center, where it will undergo thermal vacuum tests in an renovated Apollo-era chamber there. It will then be shipped later this year to a Northrop Grumman facility in Southern California to be integrated with the spacecraft bus and sunshade being developed there. The vibration test anomaly has affected JWST assembly schedules. OTIS was scheduled to go to JSC in March, but that will now take place in May, according to schedules Smith presented at the committee meeting. “That put a delay pulse in the OTIS line” of the mission’s development schedule, he said, pushing back other milestones. Smith said that the spacecraft bus has also suffered delays because of a problem during a test of its propulsion system. “They damaged some transducers so new ones had to be re-welded into a system that was already in the spacecraft bus,” he said. He added the spacecraft bus and telescope are tied for being on critical path for the overall program. Despite the problems, Smith said that JWST remained on budget and on schedule. The program currently has 4.75 months of schedule reserve, which is roughly in line with the plan at this stage in development. That schedule reserve is projected to decrease over time to deal with problems anticipated to crop up during testing.